You had no coupons yet. What are coupons used for? 8bit Limited is issuing virtual coupons that are basically combinations of letters and numbers. A coupon gives you right to activate a bonus deposit that consists a certain percentage of your deposited amount. You can give a coupon to your referrals and then they will get a bonus and you will receive referral commission. 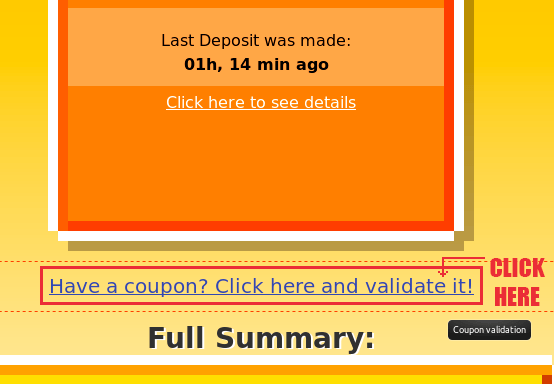 Enter coupon code in validation field at Deposit page. Hit "Next" button and review deposit details at the Summary page. 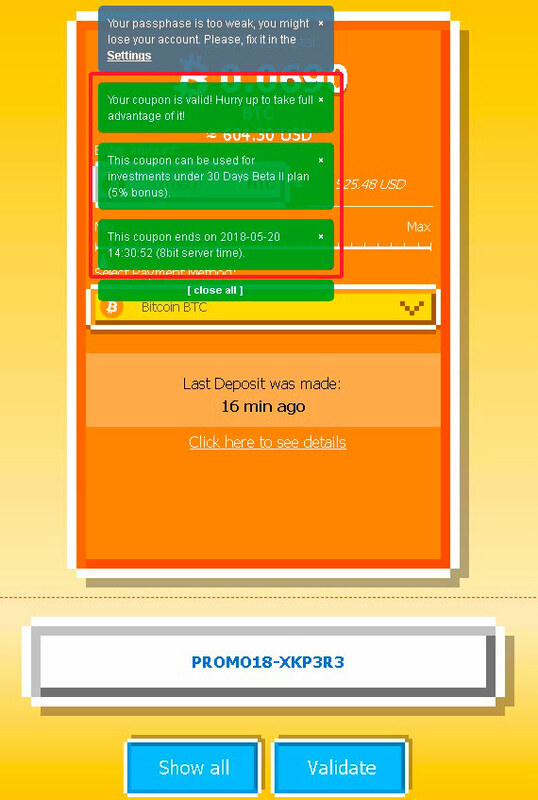 By pressing "Confirm" and making an investment your bonus deposit will be instantly activated. How long is valid a coupon code? Each coupon is valid for a limited time. Make sure to redeem a coupon before expiry. 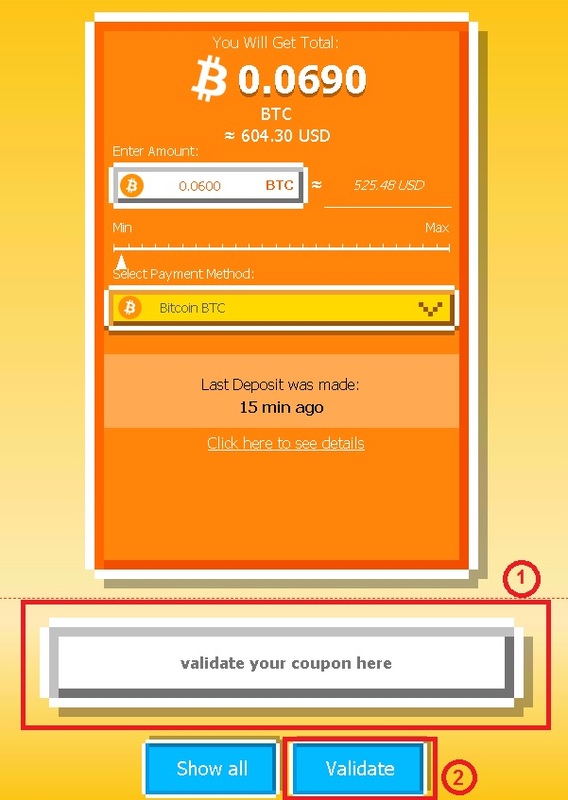 Coupon expiry date can be verified at the top of this page or at Deposit page. Keep in mind, expiry time is calculated according to 8bit server time displayed at the top of this page. Server time can be different from your local time. How many times a coupon can be used? There are two types of coupons: single-serving ones and those which can be used multiple times. Ask what kind of coupon do you have and how many times it can be used from the person who gave it to you. Before making deposit, check coupon's validity by entering its code at the top of this page or at Deposit page. Where can I get a coupon from? - to active upliners for a distribution among their referrals. How to verify a coupon's validity? - what plans are eligible for redeeming this coupon code. Please note, that different plans may offer different values for bonus deposit quota, for example, the same coupon code may give 5% bonus deposit for investment plan A or 7% for investment plan B. How coupons and bonus deposits are activated? A bonus deposit of amount equivalent to a coupon's deposit quota is credited to the same investment plan that was selected for your deposit. This bonus deposit gives you interest in accordance with an interest rate applied for an investment plan selected for main deposit. For example, suppose you have a coupon for 10% bonus deposit valid for 5 days. You make a $1000 deposit for an investment plan "0.5% daily for 30 days" with a return of a principal deposit. While making it, you redeem your 10% coupon. Thus, you will have a bonus deposit of $100 credited to the same investment plan. Over the course of next 30 days your profit from the main deposit will consist $150. In the meantime, your bonus deposit will generate a $15 profit. $15 (as profit from bonus deposit). Your total profit in this case will be $1265. A bonus deposit is credited to the same investment plan as the main deposit. Bonus deposit is credited using the same payment method as the one used for the main deposit. Accruals for bonus deposit are made in accordance with schedule applied for the selected investment plan. Eventually your total profit will be higher than amount you receive as bonus deposit. For instance, you redeem a 10% bonus coupon for an investment plan "0.5% daily for 30 days". As your deposit bonus is 10%, your final profit for this bonus deposit will be 11.5% in relation to the amount invested initially.